Heavenly blog! : No. 1714: My most read article so far on all the blogs and sites we have! No. 1714: My most read article so far on all the blogs and sites we have! No. 1714:My most read article so far on all the blogs and sites we have! Picture of the wizard and the false apostle Jan Hanvold, the "gate boy" from Drammen. There are many who read on all of my web pages which are actually a part. We have website, teaching blog, Israel blog and other blogs.Here is the most read article we have posted to now.It only shows that Christians and people in general are concerned that the truth will come forth, not just the thing that is clairvoyant in the ear.Unfortunately, most of the Christian messages are "sucking" to the degrees today that it tastes sweet and disgusting. We need other flavors than just sweet, we need all tastes like this. It is among other things sweet, sour, bitter, salty and umami.These are the five tastes of the natural person, so it is also for the spiritual person that we have at least five different flavors that belong. Here is the most read article we have posted to now. Jan Hanvold, a false prophet! By Evangelist and Bible teacher Jan Kåre Christensen, Smyrna Oslo. 1.) Hanvold is divorced and lives when he writes the scripture. Luke 16 18 Whoever divorces his wife marries another woman, he is angry, and every one who marries a woman divorced from her husband is in charge of mischief. 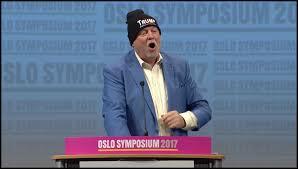 A prophet is a person or messenger who is considered to be able to convey and reveal a religious message from God.Jan Hanvold himself said when he prophesied on Vision Norway that Mrs Clinton became the next president, if this does not come true, then I am a false prophet, which he was quite right in. My dear, do not believe any spirit! Try the spirits if they are of God! For many false prophets have gone out in the world.Many false prophets must stand forth and lead many villages.For false messiahs and false prophets shall stand forth and make great signs and wonders, to bring the chosen wills, if possible. 3.) His monetary deduction is manipulative and unbiblical. He promises on behalf of God, which no one has authority and power to do. 4.) He talks about sowing and harvesting, like a mantra. 1000 kr to him, so you get 10,000 back. This has never promised God in his word. 5.) He takes pride in the generosity of seductive and seduced people, frighteningly that he is pouring millions into this, as he also pours abundantly into his own pocket. 6.) Condemns others and reproves others, but lives in sin and engages in unbiblical teachings. This is contrary to the teachings of Jesus and the word of God. It is only when we have adapted our own lives that we should be bold to reveal and rebuke others. Here is the Bible really radical, read yourself! Matt. 5. 19 Therefore, whoever breaks one of these least commandments and teaches humans thus, shall be called the least in the kingdom of heaven; but he who keeps them and teaches others, he shall be called great in the kingdom of heaven. 20 For I say unto you, If your righteousness does not transgress the scribes and Pharisees, you will not enter into the kingdom of heaven. and they shall be my people. do not touch anything unclean! says the Lord Almighty.7. 1. My dear, when we have these promises, let us cleanse us of all impurity on body and soul and complete our sanctification in fear of God. No. 1712: My most read article right now! Nr, 499: Todd Bentley remarried with his former nanny - popular as never before in the Pentecostal charismatic circles where Gods Channel fronts him through his television broadcasts to millions!